Mike Lawrence has been playing the upright bass since age 10 and the electric bass for over 15 years. Playing out in bars and clubs with bands from age 16, Mike has been hooked on playing music for a live audience ever since. Freelancing in a variety of settings, everything that requires a bassist from jazz duos to 20 piece big bands, blues, rock, and funk groups to singer/songwriters, Mike's primary focus is now playing with various jazz musicians as time allows. He has performed with his fair share of artists found on Albanyjazz.com in and around the Capital District. Recent gigs include Keith Pray’s Soul Jazz Revival, Dave Gleason/Pete Sweeney/Sensemaya, Yuko Kishimoto Trio, Joe Finn, Mark Capon, Mike Benedict’s Jazz Vibes, Charlie Smith Blues Band, Tas Cru Blues Band. 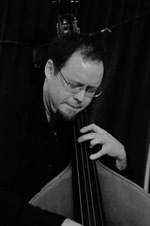 Teaching occupies many of his daytime hours for the past 7 years both at public school and private bass students; Mike holds a Master’s degree in Music Education from Boston University, Bachelor’s degree in Music Education from the College of Saint Rose and certificates from multiple summer programs he attended at Berklee College of Music when he was a teenager. Currently, Mike plays a vintage Kay upright bass, an ash body Fender Jazz Bass, and a fretless Fender Jazz Bass. Amplification is typically a Gallien-Krueger 400RB with Bag End 1x15 and/or SWR Goliath Jr. 2x10 speaker cabinets.